I swear, counted among the subscribers to my RSS feed have to be Clotho, Lachesis and Atropos. Thanks girls! 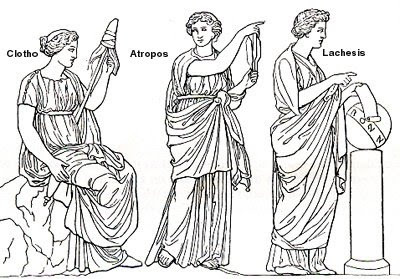 Clotho, Lachesis and Atropos were the Three Fates Greek mythology. They controlled the thread of a person's life and even the mighty Jupiter cowered in front of them so powerful were they. I think they read this blog because after my whine yesterday about how put-upon I was to have to assemble a cheap bid for a builder, things took a turn for the better in the form of another builder who met with me yesterday at 11. Mr. Wise and Brave Builder is building a three million dollar spec house and came to me with a six figure budget for a kitchen and four bathrooms. This same builder handed me a set of prints and told me that he didn't like how his architect had arranged the interior spaces and he wanted me to take a look at everything and make whatever changes I thought would be a good idea. Now that's how it's supposed to work. Hah! So I suppose my boo-hoo-hoo-ing was heard by somebody. Or not. Maybe it's just that I have a good reputation and a proven track record. Hmmm. OK, new rule. No more doom and gloom Sunday morning pundit shows on MSNBC. 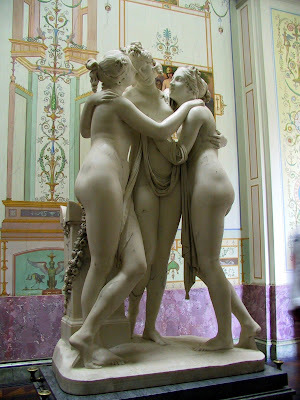 Now I just need a visit from Aglaia, Euphrosyne and Thalia --the Three Graces. Hah! So despite my pleasant uptick in both my outlook and my workload yesterday and in keeping with the times, I'm going to spend the next couple of days talking about cheap and quick fixes. Reasonable, simple ways to give your home interiors a tune up. So stay tuned. Starting tomorrow, I'm going to talk about the dos and don'ts of painting existing cabinetry for the next couple of days. 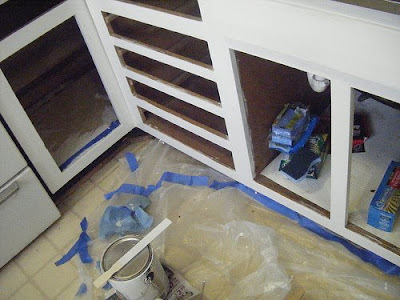 I've been researching the topic and I heard from a reader in Minnesota who told me a cautionary tale about his cabinet painting project gone wrong. It's gone too far. Officially. I won! It's a Christmas miracle! Cheap Fixes: Get ready to paint. Cheap Fixes: First up, clean and purge! She's a fixed! I think.